With the imminent arrival of the “Deep Impact” spacecraft at the comet Tempel 1, it is time to test competing theories on the nature of comets. The predictions and lines of reasoning offered here will set the stage for future analysis of the “electric comet” model. We are posting this document at 1:45 a.m. Sunday, July 3, with “Deep Impact” less than 24 hours away. This Picture of the Day will remain through July 4. It will be followed within 48 hours (or less) by another Picture of the Day with a preliminary evaluation of the event. At 10:52 p.m. PDT July 2, the Deep Impact spacecraft will fire an 800-pound copper projectile at the nucleus of Comet Tempel 1. If all goes as planned the projectile will impact on the nucleus 24 hours later. The impact is expected to eject into space large volumes of subsurface material. Cameras on the projectile will record its approach toward the nucleus, and instruments on the spacecraft will record the event across a broad spectrum. Dozens of telescopes will be trained on the comet. According to NASA scientists, the released material will provide a sample of the primordial water, gas and dust from which the Sun, planets, moons, and other bodies in the solar system formed. Though Deep Impact team members see this as a milestone event, advocates of the Electric Universe expect a “shock to the system” with revolutionary implications. They say that a comet is not a primordial object left over from the formation of the solar system. Fundamentally, it is distinguishable from a rocky asteroid only by its more elliptical orbit. In the Electric Universe a comet is a negatively charged object moving through the extensive and constant radial electric field of the positively charged Sun. A comet becomes negatively charged during its long sojourn in the outer solar system. As it speeds into the inner solar system, the increasing voltage and charge density of the plasma (solar “wind”) cause the nucleus to discharge electrically, producing the bright coma and tail. If the electrical theorists are correct, the implications of the event will not be limited to comet theory alone. At issue is the assumption of an electrically neutral universe, upon which every conventional astronomical theory rests. An electric comet would forever change the picture of the solar system and force astronomers to consider the overwhelming evidence that electricity lights not only our Sun but also all the stars in the heavens. Moreover, the cosmic electricians insist that this would only be the beginning of a more sweeping revolution touching all of the theoretical sciences and in the end recasting our understanding of earth history and the human past. The most appropriate test of a new theory is its predictive power (see predictions from October 2001 in Wallace Thornhill’s “Comet Borrelly Rocks Core Scientific Beliefs”). Therefore, we wish to make as clear as possible, in advance of the projectile’s impact, the distinctions between the electric model and the standard model. Where the issues grow complex, the primary reason is that the standard model, which failed to anticipate any of the major discoveries about comets over the past three decades or more, has fragmented into competing versions, forced upon the theorists by unsettling facts. Nevertheless a shared ideology continues to guide orthodox comet investigation while limiting scientific perception. For this reason advocates of the electric universe do not believe that a reconciliation of the current theoretical fragments is possible. To facilitate clarity we shall offer first a brief outline of two theoretical models. As for predictions, we find that NASA scientists have retreated from such essential adventures. Therefore we shall not attempt to speak for them. But we will summarize the best guesses of the electrical theorists. Comets are composed of undifferentiated “protoplanetary debris”—dust and ices left over from the formation of the solar system billions of years ago. Radiant heat from the Sun sublimates the ices (turns them directly into vapor without the intermediate step of becoming liquid). The vapor expands around the nucleus to form the coma (head of the comet) and is swept back by the solar wind to form the tail. Over repeated passages around the Sun, the Sun’s heat vaporizes surface ice and leaves a “rind” of dust. Where heat penetrates the surface of a blackened, shallow crust, pockets of gas form. Where the pressure breaks through the surface, energetic jets form. Comets are debris produced during violent electrical interactions of planets and moons in an earlier phase of solar system history—a phase that persisted into early human history. Comets are similar to asteroids, and their composition varies. Most comets should be homogeneous—their interiors will have the same composition as their surfaces. They are simply “asteroids on eccentric orbits”. Comets follow their eccentric orbits within a weak electrical field centered on the Sun. They develop a charge imbalance with the higher voltage and charge density near the Sun that initiates discharge and the formation of a glowing plasma sheath—appearing as the coma and tail. Intermittent and wandering arcs erode the surface and burn it black, leaving the distinctive scarring patterns of electric discharge. The primary distinction between a comet and an asteroid is that, due to its elliptical orbit, electrical arcing and “electrostatic cleaning” will clean the nucleus’ surface, leaving little or no dust or debris on it. An abundance of water on or below the surface of the nucleus (the underlying assumption of the “dirty snowball” hypothesis) is unlikely. Tempel 1 has a low-eccentricity orbit. Therefore its charge imbalance with respect to its environment at perihelion is low. (It is a “low-voltage” comet.) Electrical interactions with Deep Impact may be slight, but they should be measurable if NASA will look for them. They would likely be similar to those of Comet Shoemaker-Levy 9 prior to striking Jupiter’s atmosphere: The most obvious would be a flash (lightning-like discharge) shortly before impact. The impactor may form a sheath around it as it enters the coma, becoming a “comet within a comet”. Electrical stress may short out the electronics on board the impactor before impact. More energy will be released than expected because of the electrical contributions of the comet. (The discharge could be similar to the “megalightning” bolt that, evidence suggests, struck the shuttle Columbia). Copious X-rays will accompany discharges to the projectile, exceeding any reasonable model for X-ray production through the mechanics of impact. The intensity curve will be that of a lightning bolt (sudden onset, exponential decline) and may well include more than one peak. If the energy is distributed over several flashes, more than one crater on the comet nucleus could result—in addition to any impact crater. Any arcs generated will be hotter than can be explained by mechanical impact. If temperature measurements are made with sufficient resolution, they will be much higher than expected from impact heating. The discharge and/or impact may initiate a new jet on the nucleus (which will be collimated—filamentary—not sprayed out) and could even abruptly change the positions and intensities of other jets due to the sudden change in charge distribution on the comet nucleus. The impact/electrical discharge will not reveal “primordial dirty ice,” but the same composition as the surface. The impact/electrical discharge will be into rock, not loosely consolidated ice and dust. The impact crater will be smaller than expected. We include below a summary of the lines of reasoning followed by the electrical theorists. For the survival of the standard model, nothing is more crucial than finding an abundance of ices on or below the surface of the nucleus of Tempel 1. It is not sufficient to find water merely in the comet’s coma. Negative oxygen ions from cathodic etching of rock minerals in the nucleus will combine with protons from the solar wind to form water in the coma and tail. Spectra of comets already reveal the presence of negative oxygen ions. Moreover, the ions exhibit forbidden lines characteristic of a strong electric field. There is no conventional explanation for these observations. Wallace Thornhill, whose inquiry into the electric attributes of comets goes back more than 30 years, sees a high probability that scientists will find less water ice and other volatiles than expected, both on the surface and beneath the surface of Tempel 1. In fact none of the electrical theorists will be surprised if the impactor exposes a subsurface with little or no ices. For popular comet theory this would be disastrous, since it now calls upon volatile ices beneath the surface to drive the comet’s jets and create the glowing coma. This requirement is due to the surprising discovery, through prior comet probes, of dry surfaces. The surface of Comet Borrelly, for example, was parched. But the problem for comet theory is more severe, since evidence for subsurface volatiles also ranges from minimal to non-existent. Examination of Shoemaker-Levy 9 after the comet broke apart revealed no volatiles. When comet Linear disintegrated in front of their eyes, astronomers were astonished by the absence of meaningful water content. Comets do not “disintegrate” by solar heating but explode electrically like an overstressed capacitor. Of course there are plenty of icy moons in the solar system, and the electrical theorists propose that many comets and asteroids are part of the “afterbirth” of electrical expulsion of planets and moons from their parent primary. So they do not exclude in advance the possibility of water ice on Tempel 1. But it is not required in the electrical model of comets for the production of jets, comas and tails. The first photographs of comet nuclei astonished astronomers with the blackness of the surfaces. The nuclei were darker than copier toner. This observation alone should have called into question the “dirty snowball” hypothesis. But an ad hoc adjustment of the theory followed, arbitrarily assuming that comets were parked for billions of years in deep space, where they suffered radiation damage that blackened their surfaces. Electric discharge machining “burns” and darkens the rocky comet surface. It requires no additional hypotheses or contrived history of the comet. We see examples of the darkening effect from electrical discharge on Jupiter’s moon Io and on the planet Mars. Comet Tempel 1, which NASA selected for the Deep Impact mission, is certainly not ideal for testing the electrical hypothesis. Of course, NASA scientists do not realize this, since the issue of electrical charge has no place in standard theory. Short-period comets, which move on modestly elliptical paths (the orbit of Tempel 1 stretches roughly between the orbits of Jupiter and Mars) will not experience the degree of electrical imbalance experienced by long-period comets on much more elliptical paths that take them out well beyond the orbital distances of Neptune or Pluto. The latter have much more time to adjust to the more negative voltage of regions remote from the Sun. The voltage difference of short-period comets as they approach the Sun will be much less than that of long-period comets, and they will not discharge as energetically. Nevertheless, the electrical theorists say that even a weak candidate for a test of the electrical hypothesis should be sufficient to make a good case. The radical differences between the competing models carry many direct and obvious implications. If (and it's the biggest "if") Tempel 1 is sufficiently electrically active before impact, Thornhill expects to see the usual non-linear behavior of plasma when subjected to increasing electrical stress. That is, there will be a sudden electric discharge, or arc. An electric discharge between the comet cathode and the copper projectile anode will result in X-ray emission, just as in any X-ray machine on Earth. Such X-rays are easily identifiable and in large amounts would be anomalous for a mere impact. The electric field of a comet is contained within its (Langmuir) plasma sheath, which encompasses its coma. So the size of the coma is some measure of the electrical stress the comet is suffering. Comet Tempel 1 has a small coma. Two months ago the coma was little bigger than the Earth. However, the comet is rushing toward the copper projectile at almost 23,000 mph, which will not give time for the copper projectile in the exceedingly thin cometary plasma to balance its electrical potential with that of the more negative comet nucleus. Because electric arcing causes the craters seen on comets, there is the possibility that the Deep Impact projectile will form an electrical crater as well as (or instead of) an impact crater. When the impactor arrives, Thornhill considers it likely that active jets will move or switch off, since the comet's electrical field will have been suddenly disturbed. The simple thermal out-gassing model does not expect this. Outbursts from comet nuclei frequently occur, giving rise to expressions of astonishment from comet observers. Such events do not fit well with a model of sublimating ices, and the cause remains mysterious. But such events have required cometologists to speculate about heating processes inside the comet. In the electrical model, energetic outbursts are expected due to the non-linear behavior of plasma in the changing electrical environment of the solar “wind”. Comets have flared beyond the orbit of Jupiter, even beyond the orbit of Saturn, where known icy bodies do not sublimate under solar radiation. A potentially embarrassing, ad hoc proposal has been put forward that attributes the more remote and “miraculous” outbursts to collisions with meteoric material. In fact, all energetic discharging from comet nuclei at the distance of Mars’ orbit or beyond is anomalous under the standard model. Attempts at explanations invariably expose contradictions. We see ice on Mars and on the moons of the gas-giant outer planets. Mars, of course, is the closest of the three to the Sun, but when ice sublimates on Mars, it does not produce jets. The icy moons of Jupiter do not produce jets under the influence of solar radiation. Here, the electrical theorists can only express their amazement at the general lack of attention to such contradictions when comets begin discharging even farther out from the Sun. Despite years of photographs showing collimated jets (narrow filaments that maintain their coherence across considerable distances), the artists' conceptions of comets still show jets as geyser-like eruptions, spraying out into space. An expanding jet is the expected behavior of neutral gas and dust entering a vacuum. But it is not characteristic of an electric discharge in plasma. A good look at the jets of Tempel 1 reveals the characteristic features of a plasma discharge, with coherent current filaments that do not obey the rules of behavior of neutral gases. A look at a novelty-store plasma ball demonstrates the effect nicely. On this issue the electrical theorists are emphatic: by proposing mechanical “jets” from comet nuclei, standard theory has descended into the preposterous. No analogy either in space or in experimental science supports the idea that sublimating ices 150 million miles and farther from the Sun could generate “jet chambers” or produce the sonic and supersonic jet velocities our instruments have measured. The notion is inherently contradictory and violates the most obvious dynamic principles. Collimated, mechanically induced jets over the observed distances they travel would require, first, a finely machined nozzle, even more precise than those used on rocket engines, not a jagged opening in a “dirty snowball”. The idea requires a chamber that is insulated from the Sun, though anything even casting a shadow would lead to instant freezing. The “model” also requires subsurface heating in the deep freeze of these remote regions. The “heating” would have to reach through an insulating crust roughly estimated to be ten feet deep, yet achieving things inconceivable for solar heating even in the absence of insulation. Pressure must build up to an extraordinary level. Then when the pressure erupts, something most mysterious must occur. Despite the instant release, equivalent pressures must be sustained for long periods to maintain the supersonic velocities—even to alter the orbits of comets in the way some astronomers now propose. We’ve said it before: “To save the theory astronomers now cling to the incredible”. For the electrical theorists, the answer is all too obvious. Electrical discharge accelerates material into collimated jets along the self-confining Birkeland currents that constitute the discharge arcs. If an arc is struck between the comet nucleus and the projectile, we may expect to see metals such as Li, Na, K, Ca, Mg and Fe in a flash spectrum before impact. They will have been removed from the rocky comet in the cathode arc. The sulfur molecule S2 is one of the great unsolved mysteries of comet chemistry. It has been identified in several, but not all, comets. The molecule has a very short lifetime and sublimes at a higher temperature than those found on cometary surfaces or grains. It is not the equilibrium form of the molecule either. But S2 is the kind of molecule that could be produced from rocky minerals in the extreme electrical environment of a plasma arc. Negative ions were discovered in the inner coma of Comet Halley with densities 100 times greater than expected from conventional theory. Thornhill and his colleagues urge NASA investigators to look for an abundance of negative ions in the impact ejecta. This would, of course, be an obvious signature of a negatively charged comet. Forbidden spectral lines from negative oxygen ions have been detected spectroscopically in comet comas in the past. And no one can reasonably dispute that they indicate the presence there of a strong electric field. It is advisable that investigators look at water abundances both close to the nucleus and in the far coma to see to what extent water is being formed away from the nucleus by the combination of negative oxygen ions with protons from the solar wind. The logical concern here is that these reactions will, by improper reasoning, give inflated values for the water ice abundance in the comet nucleus. The copper impactor has a camera that is supposed to be active until impact. There is some doubt that the camera will be able to provide images closer than a few tens of kilometers to the nucleus because of anticipated damage to the lens by high-velocity dust particles. However, transmissions should continue until impact, according to NASA investigators. But if an arc to the projectile occurs, transmissions will cease before impact. Of course, the most tragic potential here is that the projectile, which carries its own navigation instruments, could experience an electrical disruption before it had maneuvered itself into the precise position required for impact. A mechanical impact will not produce the temperatures of an electric arc, which can be tens of thousands of degrees over a very small area. The problem will be whether temperature readings will have the resolution to be able to distinguish a very high temperature over a tiny area or merely an average over a large impact area. Anomalous high temperature readings could precede physical impact, accompany impact, and follow impact. Tempel 1 is a magnitude dimmer than (i.e., less than half as bright as) expected from the comet’s previous approaches to the Sun. Conventional theory has no explanation for this lower energy. The electrical model notes that the Sun is approaching the minimum in its sunspot cycle, which means that the solar electrical energy input is at a minimum. Because the comet’s brightness depends on electrical energy from the Sun’s circuit, the effect is analogous to turning down the dimmer switch on a light bulb. This lower energy level also reduces the likelihood of the more dramatic “electrical fireworks” during Deep Impact’s encounter. 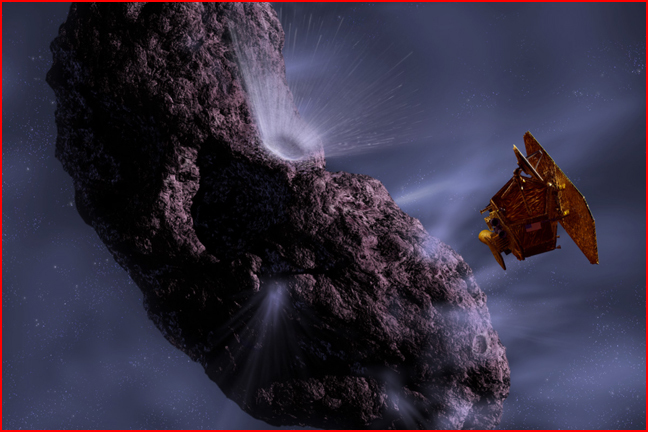 Dec 29, 2004 Electric Comets and the "Domino Effect"
Nov 22, 2004 What's in a Comet's Tail?